From this version of WP Security Audit Log you can exclude WordPress users or roles from monitoring. 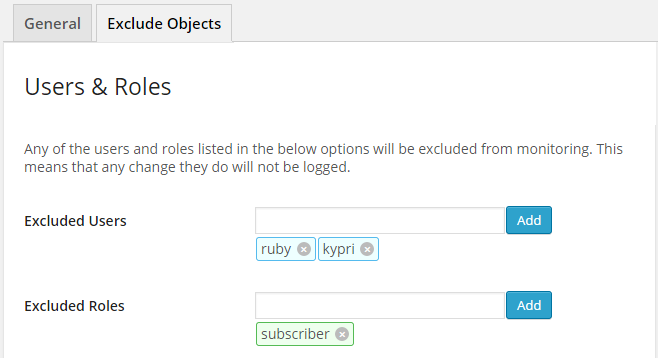 To exclude users it is very simple; navigate to the plugin’s settings and in the Excluded Objects tab specify the users or/and roles you would like to exclude from monitoring, as shown in the below screenshot. Once you exclude a user or role, any change the excluded user does will not be logged in the WordPress audit log. We are not exactly fans of excluding objects, ideally everything should be logged. Though the option is still there for anyone who might need it. By default WP Security Audit Log keeps track and logs all of the custom fields changes in blog posts, WordPress pages and also in custom post types. Although this is a very handy feature for many, some plugins update custom fields each time a visitor accesses a post, hence the WordPress audit log is polluted with the same alerts. Similar as to excluding a user or role, click on Excluded Objects in the plugin’s settings and specify the custom fields you would like to exclude. You can also exclude a custom field from being monitored by WP Security Audit Log plugin from the WordPress security alert itself, in the Audit Log viewer. As seen in the below screenshot, in a custom field WordPress security alert you have the option to exclude the custom fields from monitoring. Just click the link and it will be excluded. Once a custom field is excluded from monitoring, any changes applied to that custom field will no longer be logged in the WordPress security audit log. In version 1.5 of WP Security Audit Log we also introduced a new table in the WordPress database called wp_wsal_options (wp_ is the WordPress database prefix. If you changed your WordPress database prefix it will be the same as your database prefix). This table will be used to store all of the plugin’s settings. The plugin’s functionality is growing and with time we are introducing more options hence it makes more sense to centralize all of the plugin’s options in one central table. This version of the plugin also includes some minor improvements. Refer to the WP Security Audit Log changelog for more details on this new version.